Caught these two babies sitting on the table and sharing wafers with each other, the wafer is still evident on them lol! They were having fun baby talking to each other and eating their favorite wafer biscuits when I told them to smile and look at me. They gave in and posed before my camera with their own different ways of making cutie smiles. They love the clicks of the cam! 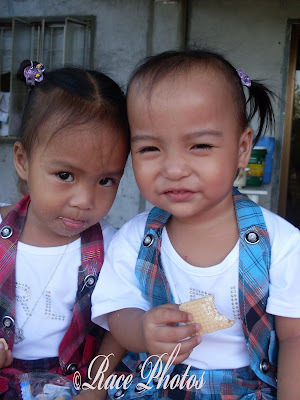 Anyway these two little cuties are my goddaughters and they're cousins, daughters of our Pastor's daughters, got it! They're one year and 10 months here! Click on the badge for more WW entries.